I saw a student taking a nap in the library one day last month. He had pushed two ottomans together next to the desk where his scattered papers, textbooks and food wrappers told the story of a very long night. Nothing remarkable; it’s that time of year. Among the debris sat his open laptop, and I couldn’t help but notice he had a full-screen Skype window open where I saw another young person, sitting on a bed, seeming to watch her friend sleep. I walked by again about an hour later and our student was still asleep; his friend, still visible on the screen, had gone to bed too. I tell this story, first, because I think it’s funny, and second, because it illustrates how intimately the rising generation of scholars have integrated technology into their lives. The number of sophisticated tools available to them actually makes me jealous, and the fact that they often see these things as part of the natural order of the universe makes me feel prematurely old. If they expect to be able to collapse geographic distance so they can take a nap together, what might they want to do for their dissertation? In the coming months, the library will make a big push toward being ready for whatever they imagine. For the past several months, library and UTS staff members have been meeting regularly to research and create a vision for a space that will collocate technological resources and staff inside a collaborative working environment. The Research Commons will be the result of that planning, envisioned as the place where graduate students and faculty will partner with library staff to produce astonishing new scholarship that takes advantage of emerging technology. We are now in the process of working with an architect on the physical layout of the space and, while plans are still evolving, I can report that the space will be flexible and open in order to accommodate a wide variety of activities and build a community of creative and collaborative scholars. The implementation will necessarily occur over several phases as we work to secure funding to carry out the vision and plans. In our meetings, terms like digital scholarship and digital humanities get plenty of use. To be sure, these concepts are useful for now because they represent emerging methodologies and forms of scholarly communication that are in many ways distinct from other, more traditional forms. However, the modifier digital eventually will be dropped because it will cease to signify anything special. Meanwhile, scholarship will go on, expanding our understanding of ourselves and our world. There is a parallel to what is happening in the library. We are very excited about creating something truly innovative for our users but I see this as an evolution, not a revolution. The library has always been a place where research projects emerge and librarians have always worked with scholars to create them. It’s just that now those projects might be interactive maps loaded with historical data and displayed on mobile devices. Librarians would still be crucial partners but they might find themselves recommending content management systems and advising on how to design digital projects with long-term access and preservation in mind. I’m tempted to make an analogy between the sleeping student who enhanced his nap with technology and scholars who will enhance their work in the Research Commons. That would be a cute way to bring this column full circle, but it would not do justice to what the library is planning. Librarians in the Research Commons will not assist scholars simply to enhance their work but to help them understand how to take advantage of all the tools and resources they have at their disposal to create powerful and engaging scholarship. 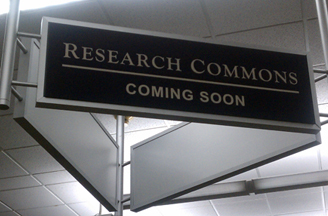 We are eager to get started and look forward to hearing your ideas and working with you in the Research Commons.